Hey Friends, BSNL is Back in DATA BONUS with New Offer to every BSNL User. 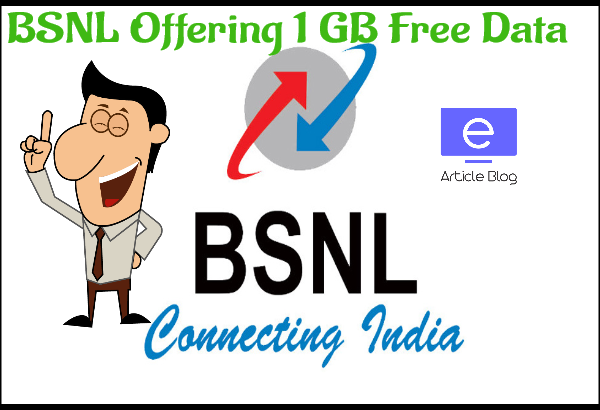 BSNL Offering 1 GB Free data to every BSNL Customer for Prepaid & Postpaid user too. So Your will get Free Internet with this Exclusive Offer. As I told You this offer for All India BSNL user which is great thing Because as You know BSNL facing tough Competition from Airtel, JIO & Idea. So This 1 GB Free Data Offer keeps BSNL user base with them. Previously BSNL Launch Some Good Plan in This year which is cheaper than other Networks Plans. Also, They announce 5G Launch in Upcoming Time so they Prepare for next data War. 2- Open app & Skip welcome screen. 3- Then, On Login Screen, Click on Register Now Button. 4- Then Enter Your mobile number email id and Password and continue. 5- Then verify Your BSNL Number Via OTP. 6- Done! You have Verified Successfully your number. Your 1 GB Data Credited in your BSNL account in about 24 hrs. Postpaid User data Will Credit Next Billing Cycle.